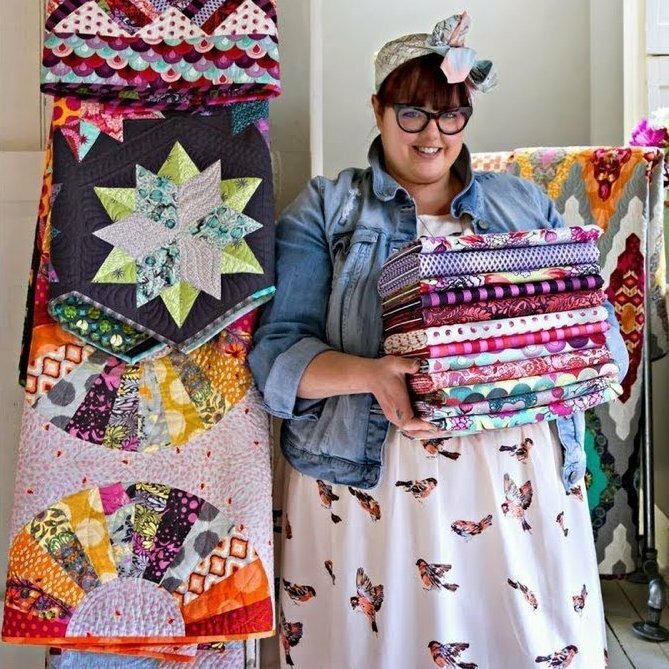 Tula Pink is an illustrator, a fabric designer, a quilter, an author, a maker and a generally good and funny person. She graduated from Otis College of Art and Design in Los Angeles, CA. Tula worked briefly as an exhibit designer for museums in Southern California, where she grew up, and when that became too quiet she relocated to the music industry. After about 5 years she left her job and California and went in search of a new home. The plan was to move as far east as she could get without renting a boat and work her way back west until she found a place she liked. Tula got about half way and then she ran out of gas money, so she stayed put. Tula now lives in a small mid-western town outside of Kansas City, MO in a house that used to be a barn and still sort of looks like one. Tula's main function in life is fabric design. She lives for it. Her signature designs have been adapted to fabrics, woven ribbons, paper products, needlepoint kits, embroidery patterns and sewing machines and can be found in independent fabric shops and retailers all over the world. Tula is most recognized in her industries for her dark sense of humor, a flair for hiding animals in the strangest of places (artistically, not literally) and her boldly unique use of color and pattern. Today Tula Pink works closely with the good people at Free Spirit Fabrics to develop multiple fabric collections every year, is an Ambassador for BERNINA sewing machines, develops collections for Aurifil Threads and Renaissance Ribbons and writes books for F+W Media about quilting and sewing. Class registration opens April 1. No fooling!